We discovered a vintage find that is a great example of stylish mid-century advertising. This sample display from the Independent Nail & Packing Co. was created using type fonts and colors that were very popular in 1957—the copyright date of the printed display. The bold red, black, white and pink are all colors that were very popular in the late 1950s—remember pink tile bathrooms with black details? The specialty products Independent Nail manufactured for builders included masonry nails, Screw-Tite nails for roofing, framing nails and floor and pallet nails. 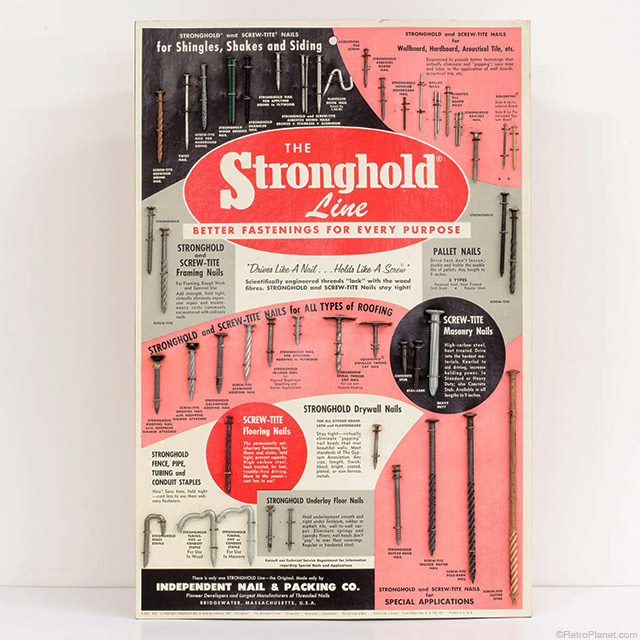 Made to advertise their wide-ranging Stronghold Line of fastener products, the Independent Nail & Packing Co. of Bridgewater, Massachusetts made all types of threaded nails for the building industry. This cardboard display showcases the wide variety of fasteners they made; from nails for shingles and siding to framing and masonry nails—this display is still intact with all of its original nails attached. 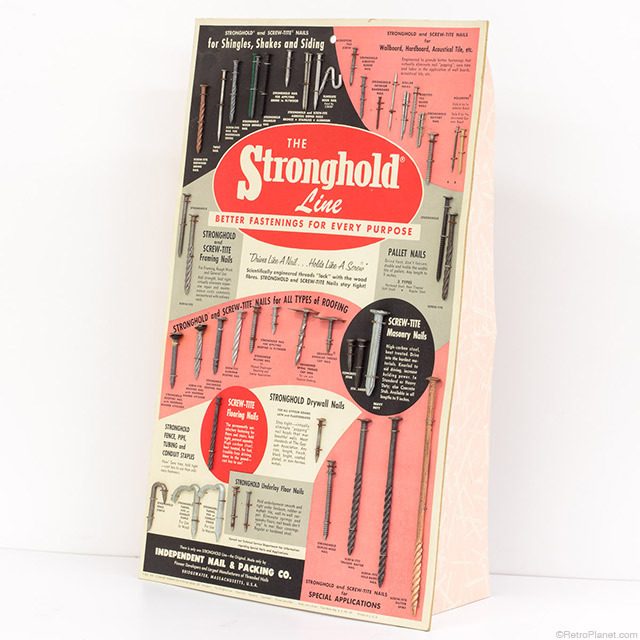 This vintage Stronghold store display was shipped flat in the original box shown here. 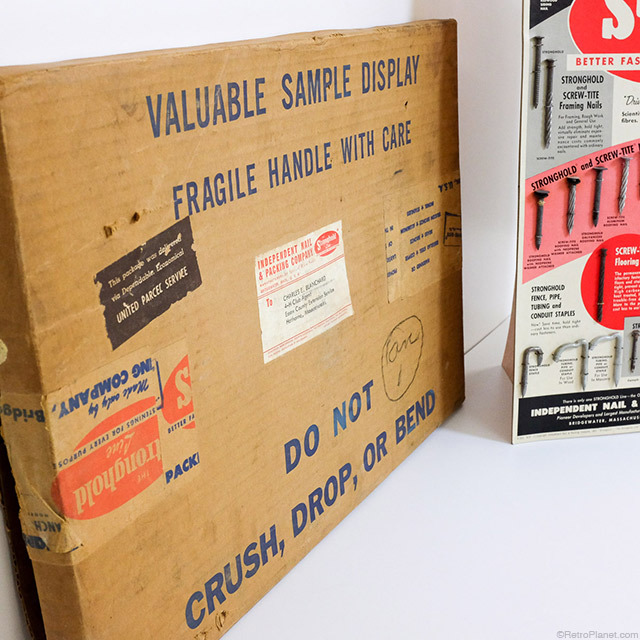 This NOS advertising board was found in the original box and has two flaps that fold out to support the display where it would have been easily seen on a countertop in a hardware store. As their tagline says, Independent Nail & Packing Co. described themselves as “Pioneer Developers and Largest Manufacturers of Threaded Nails”. NOS (new old stock) like this is not that easy to find anymore, making it very collectible among enthusiasts of vintage advertising. Independent Nail & Packing Co. was founded by George W. Folsom and Harry A. Stone in 1915. In 1920, the company was incorporated and quickly became the largest manufacturer and seller of specialty roofing and building nails in the U.S., as well as a manufacturer of threaded nails for shoe manufacturing and repair. In 1990, Independent Nail was bought by Maze Nails of Peru, Illinois, a very successful lumber and nail business since 1848 who now make and sell the Stronghold Line of nails and fasteners.